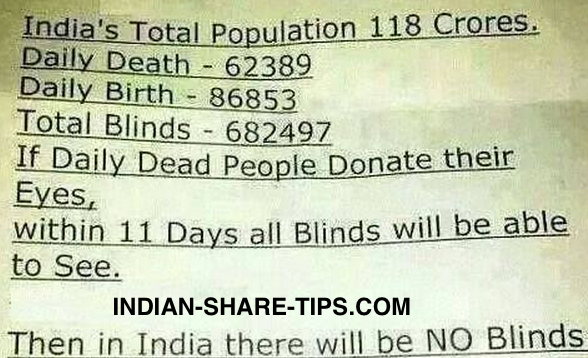 How to Make India Blind Free Nation? Eye is a gift which can not be compensated by any other form of the via media and here we share an image which shows that how a small gesture from our dying near and dear ones can make a change for the population of India. This is the reason that we have undertaken eye donation as a part of our corporate social responsibility programme to give back to the society. Please take time to share this post on Twitter or Facebook and let us be a part of the campaign to make India blind free.